Hybrid machining – the combination of additive and subtractive machining on one machine – has multiple advantages, particularly for subcontractors operating in the marine, aerospace and automotive sectors. These include the repair of damaged high-value parts, as hybrid technology can allow subcontractors to take what would normally be a scrapped part, machine away the damaged area, refill and then re-machine back to the net shape; ultimately revitalising that part. Other benefits include a considerable reduction in total machining process time, decreased waste material, and l ess time spent on material preparation, such as forging and casting. In addition, one of the biggest advantages of Mazak’s AM technology is the capability to add different materials onto a substrate, including steels, aluminiums and inconels. This gives machine tool users the opportunity to manufacture components which may not have been previously possible, by coating or adding different material onto an original component. The result is a significant reduction in production time, as well as the number of machines and operators required for a production process; and the added potential to perform repair-type operations on high-value components. 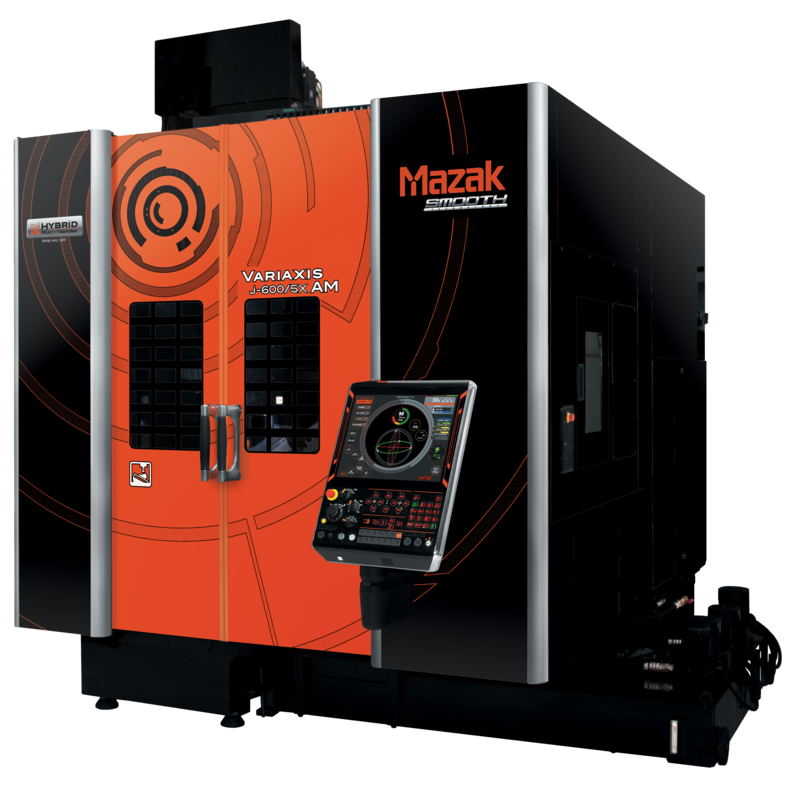 The VARIAXIS j-600/5X AM is the latest addition to Mazak’s Hybrid Multi-Tasking range of machine tools, which allows manufacturers to quickly and easily build up part features, before employing the machine’s subtractive capabilities to produce high precision parts in a single set-up. It employs a Wire-Arc AM (Additive Manufacturing) head on a 5-axis vertical machining centre. The Wire-Arc AM torch is mounted on the machine’s headstock to deposit material layer-by-layer and grow near-net-shape 3D forms. The system quickly deposits material due to the use of wire instead of metal powder. The VARIAXIS j-600/5X AM is capable of high accuracy and productivity from the 12,000rpm main spindle and the wide B-axis spectrum of rotation (+90° to -120°). The machine is equipped with a highly rigid and accurate structure, utilising roller linear guides on all linear axes and roller gear cams on both rotary axes. Equipped with SmoothX, the world’s fastest CNC, the VARIAXIS is easily programmable for both the machine and the welding automation. The j-600/5X AM is well-suited to a wide variety of machining applications, including the production and repair of marine propeller parts, molds, dies and oil-drilling components.